Intel formally announced its new Apollo Lake platform for affordable PCs at the 2016 edition of the annual Intel Developers Forum in Shenzhen, China. CPUs based on this design cane be used for a variety of device types, but the company is specifically targeting the new netbook-like "cloudbook" category of affordable clamshell devices. 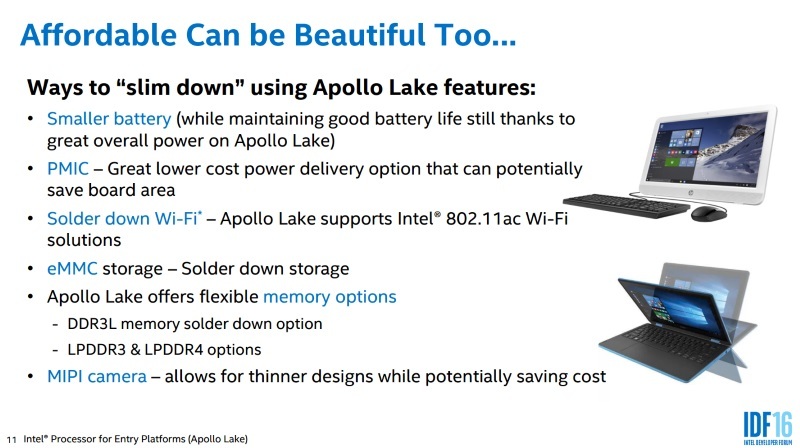 Apollo Lake is based on the 14nm Goldmont microarchitecture refresh, and will succeed Braswell. The final products may be branded Atom, Celeron or Pentium. Intel's pitch to product designers and manufacturers promises support for low-cost storage and power delivery components, as well as improved performance and battery life. Apollo Lake processors will have up to four CPU cores and a ninth-generation GPU. Hardware support for the HEVC and VP9 video codecs has been beefed up, and Intel also promises USB Type-C which can be serve double duty for data transfers and charging. Manufacturers will be able to solder storage and RAM components to reduce device size, cost and complexity. Improved power characteristics could allow for smaller and cheaper batteries, and thereby thinner and lighter systems as well. While the new platform can be used to build a variety of devices, Intel is specifically interested in the entry-level "cloudbook" product category which it says all major brands are pushing. Devices such as HP's Stream 11, Dell's new Inspiron 11 3000 and Acer's Aspire One Cloudbook are all examples of such devices. Inspired by Google's Chromebook concept, such devices typically feature only 32GB of internal storage, 2GB of RAM, and 11.6-inch 1366x768-pixel screens. They run Windows and have bundled subscriptions to various online services. Some may be convertible 2-in-1s with touchscreens. Such products are typically priced at $170-270 (though prices in India start at just under Rs. 20,000). Intel says over five million such devices have been sold since the 2014 holiday refresh cycle. Products based on Apollo Lake will begin shipping towards the end of 2016. Specific CPU model numbers and speeds will be known closer to then. Other Goldmont-based platforms under those same brands will be targeted at other product categories including tablets, all-in-ones, compact desktops, and even the embedded and server spaces.